The athletes of Eastside and John F. Kennedy High School received athletic training supplies – first aid and athletic taping – and equipment – Gatorade coolers and bottles — from three private groups. The materials are valued at $2,000. 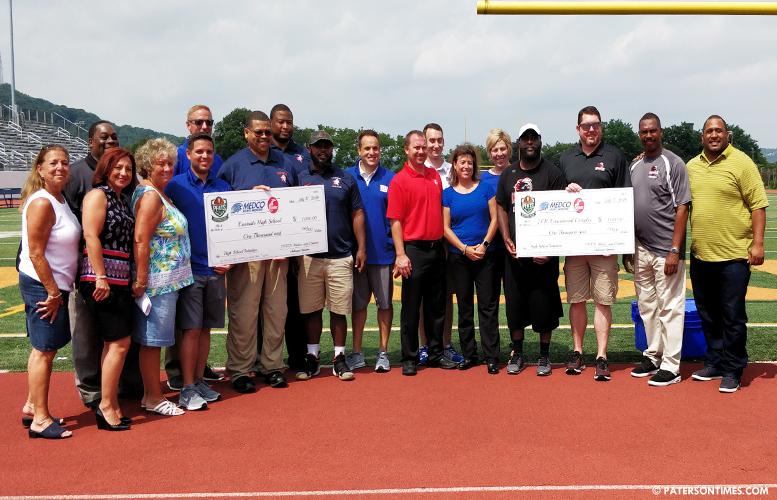 School officials accepted the donation from the Professional Football Athletic Trainers’ Society, Medco Sports Medicine, and Cramer Sports Medicine at a check presentation event at Bauerle Field on Tuesday morning. “We’re really just trying to give back to the communities that don’t have the resources to provide the athletic supplies to prevent injuries to student athletes,” said Mike Finke, general manager at Medco Sports Medicine. Finke said the Professional Football Athletic Trainers’ Society picked four teams – Indianapolis Colts, the Denver Broncos, the New York Giants, and the Cleveland Browns – and allowed them to pick recipient NFL communities. Paterson was picked by the New York Giants, he said. “This program gives us the opportunity to give back to our NFL community high schools and show that caring for our athletes at all levels is very important to us,” said James Collins, president of the Professional Football Athletic Trainers’ Society, in a statement. Some of the coaches at the district were grateful for the supplies and the equipment. “We struggle with budgeting. This will help us. A thousand dollars to us is like five-hundred thousand dollars to us,” said Tyrone Turner, head coach for football at Eastside High School. “It is for supplies,” said Gerald Glisson, principal of operations at Eastside High School, when told the dollar figure appears paltry. “For tape this is great. We ran short last year with tape,” added Turner. Superintendent Eileen Shafer thanked the organizations for their donation. “Keep us in the forefront,” she told them at the field. Weiss said the goal is to expand the program in the coming years. “This is our pilot year. The goal is to extend to all 32 NFL cities,” he said. “I hope they do expand it. We’d welcome anything they have to offer to athletic trainers and our kids,” said Anna Adams, director of health, physical education, athletics, nursing, and dental services at the district.